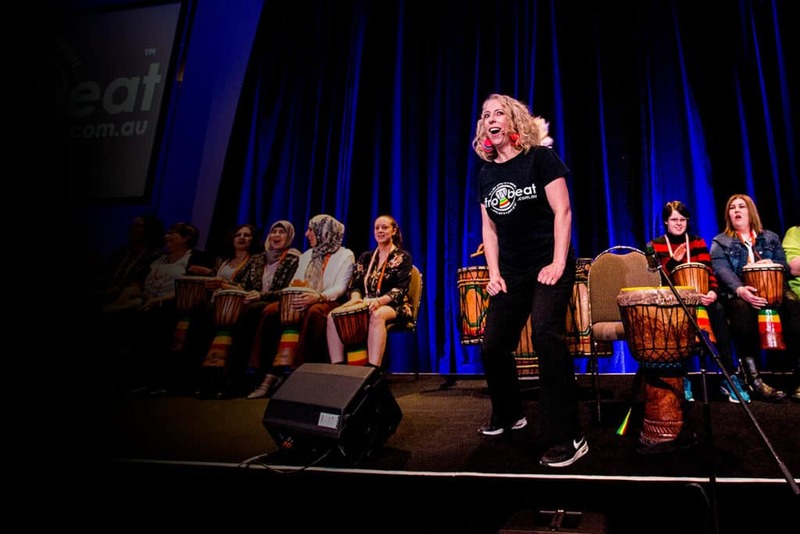 African Drumming Melbourne - Interactive Drumming for Everyone! Inspiring Interactive Drumming Experiences for EVERYONE! African Drumming is simple, fun, accessible & effective - EVERYONE CAN DO IT! 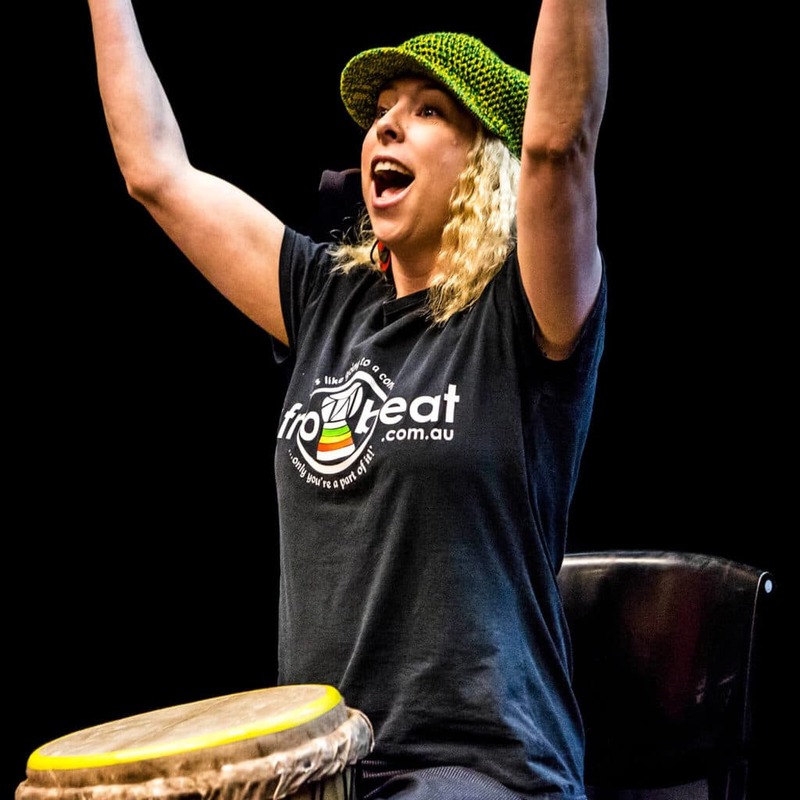 AFROBEAT deliver powerful Interactive Entertainment, Team Building, Educational Workshops, Mindfulness Programs, Youth Empowerment, & Leadership Development to the BEAT of the drum! ‘DRUMS TALK!™ ...& their message is an invitation to YOU! 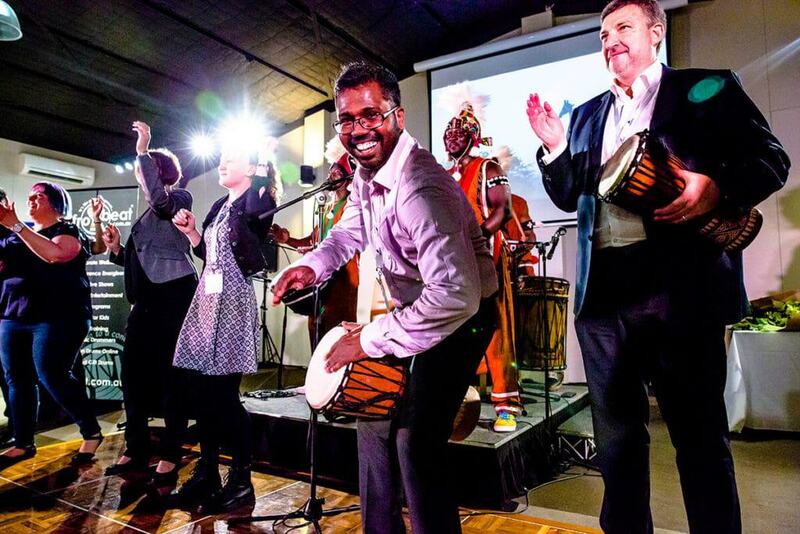 To the delight and surprise of unsuspecting audiences, Afrobeat invite EVERYONE to take up an African drum or percussion instrument of their own and join in, or get out of their seats and join our team on stage! Everyone gravitates to the beat of the drum - the response of the audience is instinctive! Within minutes! Audiences are transformed from a cacophony of noise into a lively African Drumming orchestra, their beats falling in together to create a percussive locomotive filled with power, enthusiasm and joy. With every beat, their excitement builds as they begin to sense the power of their individual rhythmic contributions and realise their musical potential and the support of their peers! Even for those who say they don’t have a rhythmic bone in their body! Through a series of dynamic non-verbal gestures and dramatic mime (much like an animated orchestra conductor!) Afrobeat weave their magic, introducing the ever popular African Djembe drum through thunderous drum rolls and infectious beats, call and response chanting, hand clapping, and dynamic movement that’s focused on maximum participation. Before they know it, the unsuspecting audience have become performers rather than spectators, and the group dynamic and team spirit begin to emerge. This in-the-moment, music-making experience concludes by beating out rhythms of unity, creating musical harmony, and an outstanding theatrical performance that is TRULY INSPIRATIONAL! Deliver an unforgettable impact at your next event with Afrobeat’s high energy, interactive drumming spectacular that’s guaranteed to WOW WOW WOW! DRUMMING Success Stories - What others are saying! One of the most inspiring group activities guaranteed to connect EVERYONE in the room within minutes! – the effect is immediate & infectious! Afrobeat deliver an inspiring Interactive Drumming Experience where EVERYONE gets a drum & an invitation to join in! Check out our Entertainment, Team Building & Mindfulness Drumming, Early Learning Incursions, School Workshops & More! A unique audience-interactive African entertainment experience guaranteed to WOW! 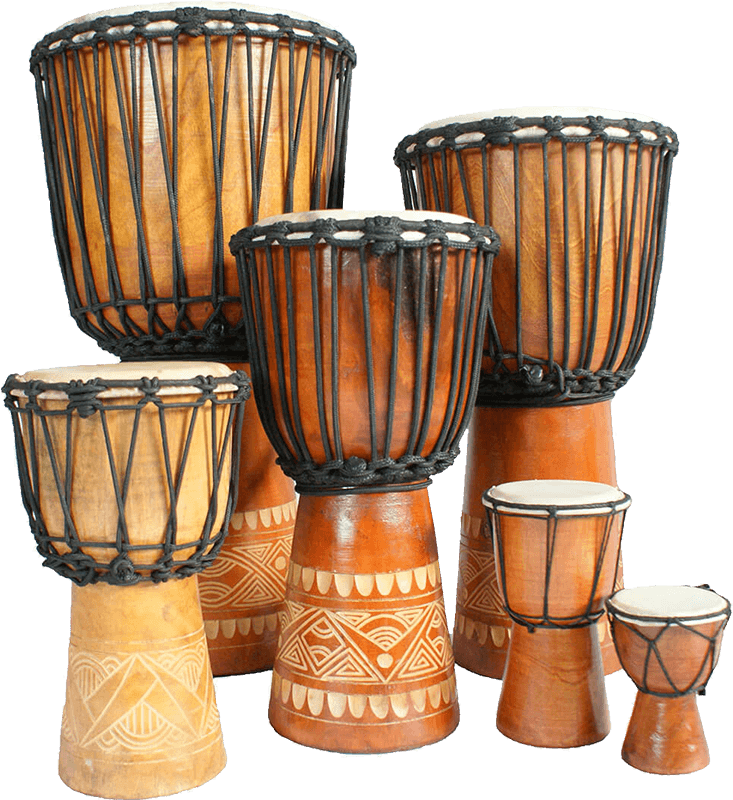 Check out our Interactive Drumming Show, African Drum & Dance Show, Acoustic African Vibes, & African Drummers for your next event! DRUMS TALK!™ is the ONLY Drum Facilitator Training to equip you with EVERYTHING you need to be successful, confident, and start right away! Whether you want to Integrate the DRUMS TALK!™ program into your School, Community Group, Early Learning Centre, or Organisation; Build your community, Develop your skills, Join our Team, or Start your own DRUMS TALK™ business... we’re here to teach you how and support you all the way!